Casa De Kids - CDK's mission is to build an orphanage in Oaxaca, Mexico, and partner with existing orphans' programs. Your Support Will Empower Orphans – Meet Sochi! We ended 2017 by accepting three new female college students into our program, 2 new high school students, and hosted a Christmas luncheon for 15 people. All of the students in attendance received motivational books as gifts. Younger kids in the orphanage were given new shower sandals and gift bags of holiday candies. Each month we donate cheese and egg products to them to supplement their diet. We at Casa de Kids would like to thank the many recent individual donors for their generous donations, most of whom prefer to remain private. You have enabled us to send a new female student to a local university, whose dream it is to become a teacher, and for us to send two new young men to attend local high schools. We also wish to thank the members and friends of the following communities for their generous support to our non-religious work: Celebrate Life Spiritualist Community (San Francisco, CA), Fraternal Spiritualist Church (San Diego, CA), and Sarasota Center of Light (Sarasota, FL). Their donations have made it possible for us to fund over 20 students’ remedial classes preparing them to enter local colleges and universities; without which they would not quality. Thank you for your love and belief in our world’s children! We know that even one educated child can help change the world. Thanks to you we are now sponsoring three full time college students, and two high school level students. 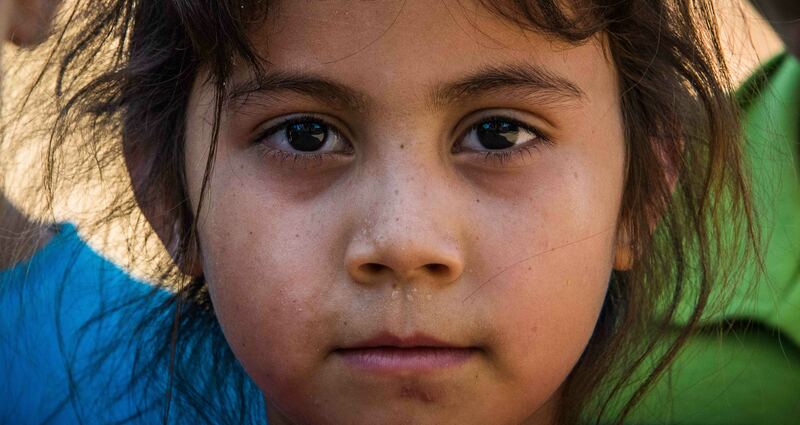 We continue to support the residents of Casa Hogar orphanage as needed, for example supplementary foods, school uniforms and supplies, and hygiene items. In last twelve months Casa de Kids has hosted over 20 social events with these worthy kids. These were fun and educational events outside the orphanage, such as birthday parties, graduation celebrations, museum outings, and recreational trips to local parks. If you are inspired to donate to these amazing students’ ongoing expenses, your tax-deductible donation can be made securely on our website here, or you can mail checks to CdK to: PO Box 51282, Sarasota, FL 34232. Humanitarian projects are dependent on humans making choices to volunteer. This week the entire Casa de Kids Board and I would like to thank you Martha Lopez from the bottom of our hearts for her many hours of volunteering. 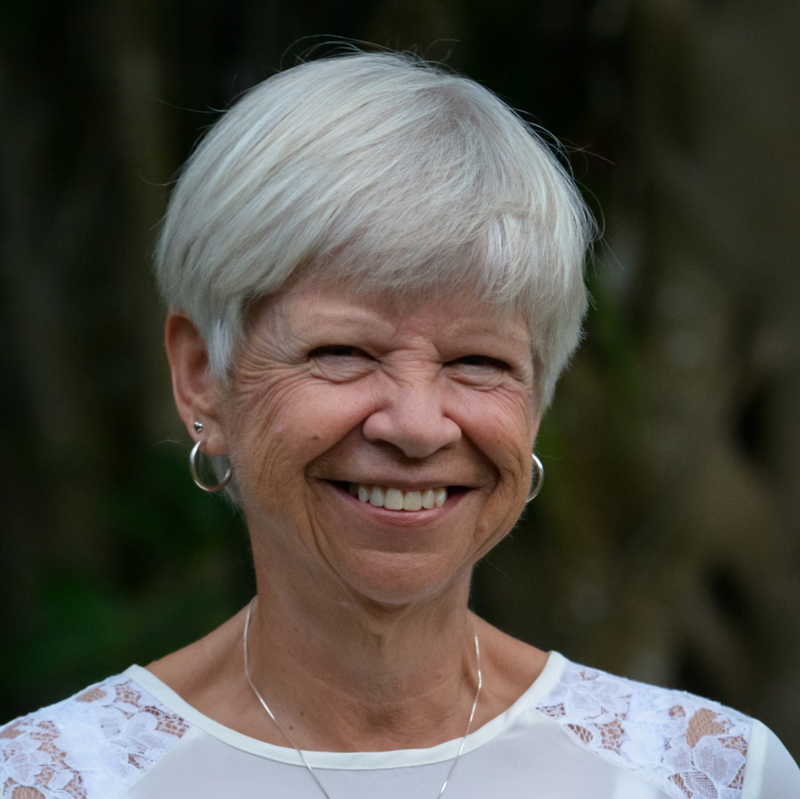 She has been a dedicated wellspring of talent and service on our Board. While she is moving out of her CdK Vice President’s role to focus on her career, we wish her all the best of personal success and joy. Her many efforts with our social media and fundraising have been invaluable and we are forever grateful. Thank you Martha for inspiring us so much. Yesterday, on your behalf, we took some of the kids out grocery shopping at a local Oaxaca market. They especially needed cheese (a rare luxury in their dining room), so here they are showing off cheeses we bought with Jeanne Avery’s help. Here’s our exciting news from Mexico! Last Friday, June 3, 2016, representing Casa de Kids, my associate Jeanne and I were scheduled to meet with supervisors of a street children’s project. We were arranging to sponsor ten children’s education, here in Oaxaca, for one year each! So-called “street children” are kids who cannot afford to go to school and so they end up working in the streets alone selling trinkets while their parents (if they have them) are away or at work. To our great surprise, when we arrived at the appointment, not only were the ten kids present–so were their moms! These five girls and five boys could not go to school due to lack of funds and were on a waiting list for sponsors. (Here in Mexico, public school is not “free”, there are fees such as uniforms, books, etc. without which enrollment is prohibited. Their appreciative moms were glowing with smiles while the kids were bright-eyed and beaming with promise. Several of them gave us little gifts, or wanted their photo taken with us. The shy moms gratefully shook our hands, seemingly in awe at such generosity by strangers for their babies. The amazing thing is that sponsoring all ten kids for one year each totals a mere: $2,500. USD! Soon we will be able to meet individually with their families as well as receive report cards from their schools. We are thrilled by so many donors’ assistance that makes this possible. For every child we help out of poverty–we change the world! We will keep you updated with more good news in the near future! Muchas gracias for your interest and support! In gratitude, Drew L. Vogt, CdK President, Oaxaca, Mexico. What a busy month it has been thus far! 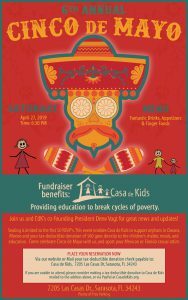 May 2 was our travel date to return to Sarasota for the third annual Cinco de Mayo fundraiser. Thanks to all of you who supported CdK in this endeavor and special thanks to JimmyLee Trautwein and Michael Mrazik for their countless hours of preparation. Together with their team of volunteers, this event was once again a great success–just ask anyone who attended. Now back home in Oaxaca, life is getting back to “normal” but hasn’t slowed down one bit! Last evening, we celebrated Santiago’s 21st birthday by treating him to a nice dinner at a restaurant overlooking the Zocolo. (For those of you who don’t know, the Zocolo is the beautiful town center in Oaxaca. It is lined with trees, has a huge fountain, and is always bustling with activity.) 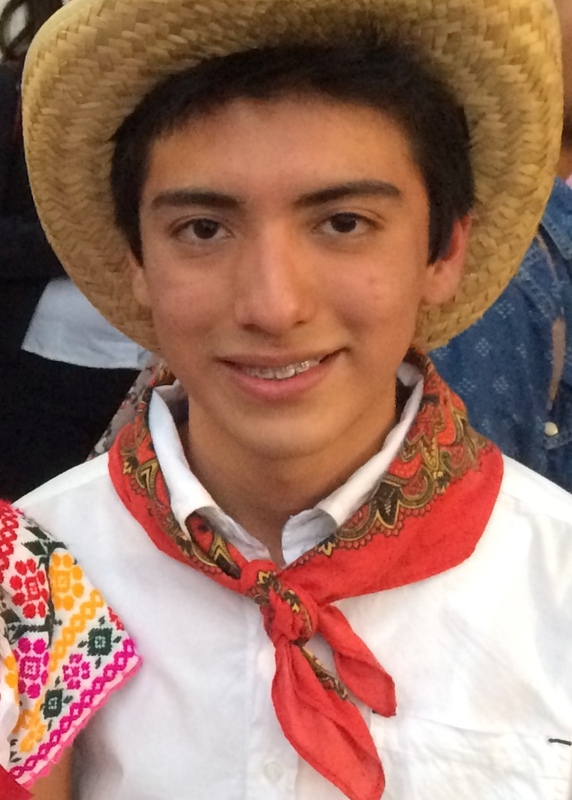 Santiago is currently employed at a company in Oaxaca center doing computer work five days a week. He lives approximately 45 minutes out of town and rides a bus to and from his office every day. His dwelling is small, not allowing him the ability to prepare meals. So, most days, sandwiches are his only option. Dining in a nice restaurant was a rare treat and something, I believe, he will remember for years to come. It made my heart joyful to see him smile. What a fine young man he is! 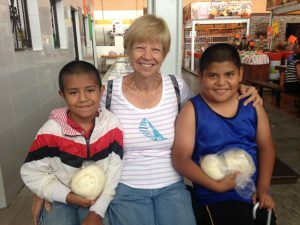 So much credit for the boys’ successes are due to the “mother” they have in Lulu who has taught them life skills during their time in Procasa Hogar and continues to mentor them into adulthood. My focus is now turning to Daniel. He is a teenager and struggling in school. His grades have been poor. But, I am convinced that with some effort on my part, CdK can find Daniel tutoring to help him over this rough period. I have already made a contact and plan to investigate further who might be best able to assist us in getting Daniel the help he needs. Luborio is a young man who tries not to smile. He would like to but the need for dental work keeps his smiles to a minimum. Two years’ ago, there was a group of dentists from Michigan doing volunteer work in Oaxaca for a two week period. Perhaps there is another group of dental volunteers planning to visit. I know there is help out there–free or not! Dental work for Luborio could change his life. CdK can make it happen for this deserving young man. Drew has watched these boys grow up during the years he has been travelling to Oaxaca. Now that we are living here, we can zero in on where the need is the greatest. Daniel and Loborio will be my focus until their needs are met. I will keep you updated on the progress. It takes time to make the contacts and implement a strategy. But, it will happen. Two years ago, when I was visiting Oaxaca for the first time, I realized that we only need to help one child and that child could change the world! That thought will remain with me for as long as I can make a difference. Together, the differences we make will be huge! Life in Oaxaca is everything I thought it would be and much more. I feel I have arrived “home” with a purpose. Drew and I have been living here since February 1. As you can imagine, it took us time to get settled into an empty house. I can’t tell you how many times I needed something only to realize I hadn’t brought it with me on the plane but had it “shipped” (the dreaded word!). But, finally, all the shipped items arrived mid-March. Another step closer to making the house feel like our home. In spite of all we needed to accomplish, we have been able to find time to focus on our true mission. We began reacquainting ourselves with the young boys ages 6 through 11 at Procasa Hogar in Oaxaca Centro. There are currently 13 boys residing in the orphanage under the direction of a wonderful woman named Lulu. She is their everything! 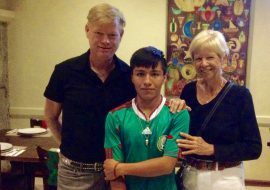 Together with the boys’ athletic director, Enrique, Lulu somehow manages to truly care for each and every youngster. I can feel the good energy throughout the orphanage from the moment I walk through the door. The boys and staff are always extremely enthusiastic to see us arrive. But, not surprisingly, Drew can light up their little faces. During our first visit to the orphanage this year, we found Christian with two broken arms. He was unable to attend school or play with the other boys. Sad face ? I must say! When the time came to say adios, Drew had brought a smile to Christian’s face and a sparkle back into his eyes. I am happy to report that Christian has mended and is back in school and back to rough-housing (yes, rough-housing) with his friends. 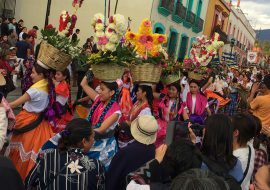 Continue to follow our adventures and accomplishments in Oaxaca and learn how you can make a difference. We have only just begun! All donations are tax-deductible to the extent allowed by law. You will receive a US Dollar donation receipt via email. Please consider donating and helping orphans in Mexico. Donate today.